Day 6: last stations off the Otago Peninsula sampled. We are ready to move towards the Auckland Islands. 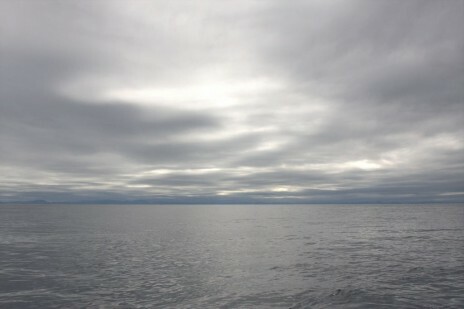 Remarkably calm conditions off the Otago Peninunsula allowed us to sample all the stations of our fish diversity survey in a short period of time. 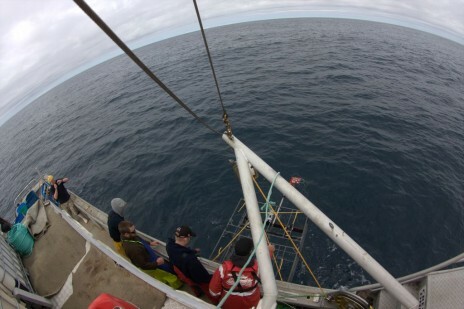 We have been blessed with good weather conditions for the last six days which allowed us to complete quickly our diversity survey between 50m and 1200m depth off the Otago Peninsula. We have deployed 50 videos units, capturing over 150 hours of footage. Twenty fish traps sampled the fish fauna over the last days as well. The fish trap highlight is the capture of a hagfish specimen which is not looking like anything we have seen so far. It is hard to tell for sure at this stage if this is a new species, but it may well be. The specimen will need careful examination and DNA analysis once we are back in Wellington to identify it with confidence. 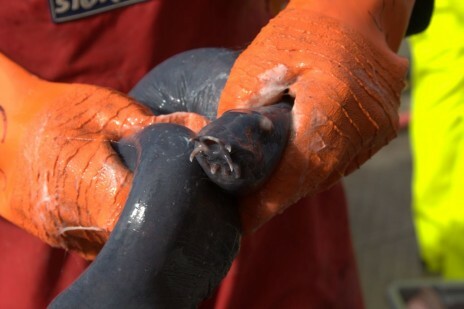 A hagfish specimen, Eptatretus cirrhatus, producing large amount of slime when manipulated on the deck. The team welcoming a video unit hauled back up from 1200m depth. Tomorrow, the boat will transit to Bluff where it will have to be inspected and cleared by DoC staff before continuing towards the Auckland Islands. It is very important to respect quarantine procedure associated to a voyage in the Subantarctic Islands. The preservation of their natural state is at stake. If the weather forecast holds, we will have a window to reach the islands on Monday-Tuesday. At least 36 hours are needed to navigate between Bluff and the Auckland Islands. I will try to continue updating you on our progress once we have reached the islands, although communication is going to be more complicated from this very remote location. Good to see you all on board guy’s! Especially with such good weather!!! Have fun and hag fish!!!!! Looks like fun Jesse! We will miss you at the “ALL MIGHTY BENT” tho bro but sweet as. Have fun, don’t fall overside and we will catchup with you when your back. from Fran Fay (Jeanie’s Mom) Glad to hear the trip is going well . Looking forward to hearing all about it Jesse. Hard to believe i was teaching about the Hag fish not to long ago in my classroom and to know real people are actually researching them is amazing. Be well and safe! take care everyone and will be following you on your journey.